Florida anti-fracking activists repeatedly claim hydraulic fracturing (“fracking”) would be detrimental to the Sunshine State’s thriving tourism industry. But their hand-wringing is unfounded. One need only look at America’s top oil and gas producing states to see that business is booming — in California and other states where fracking is taking place — for both the energy and tourism industries. And while fracking isn’t currently being used in Florida, conventional oil development has taken place alongside Florida’s tourism industry without adverse impacts for more than 70 years. In fact, both industries are critical to Florida’s diverse economy, providing Floridians with billions of dollars in revenue and hundreds of thousands of jobs. “The conditions are right for a perfect storm of tourism this summer. Still, the positive impacts of fracking may not be as clear in a state such as Florida where the practice is not currently happening. So let’s take a look at a comparable state where fracking and tourism happily co-exist. California currently ranks fourth in the country for oil production, and according to Business Insider is the most popular U.S. state for tourists, topping even Florida. 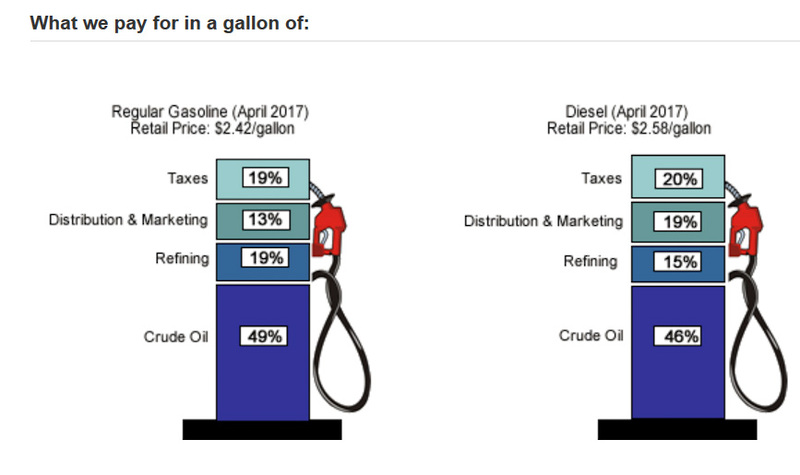 California’s petroleum industry is responsible for 1.7 million jobs with an associated $111 billion in labor income in the Golden State, and contributes roughly $26.4 billion in annual state and local tax revenues and $28.5 billion in sales and excise taxes. In fact, a study this month from the Los Angeles County Economic Development Corporation (LAEDC) found that the petroleum industry’s $148 billion contribution to California’s economy represents 8.4 percent of the state GDP. 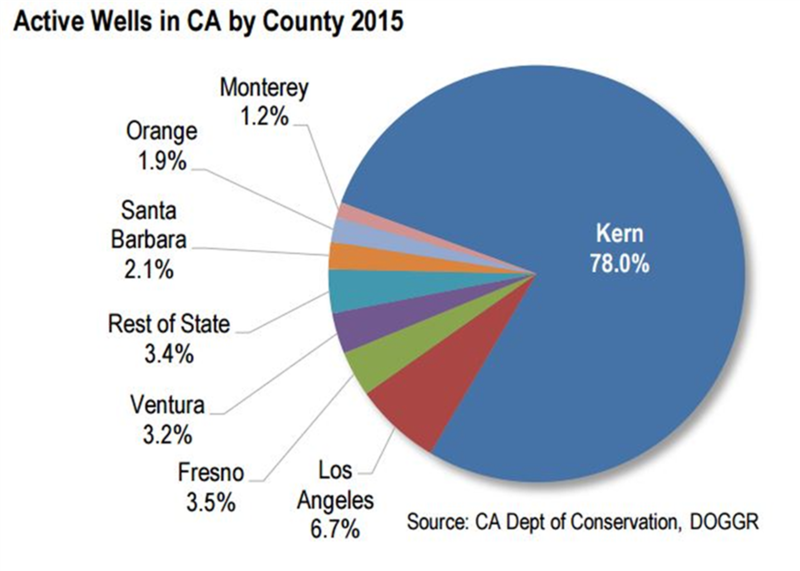 While fracking has only occurred in Kern County, conventional oil development takes places in various places across the state, and the industry has flourished without impacting groundwater, causing earthquakes, or hurting the tourism industry. 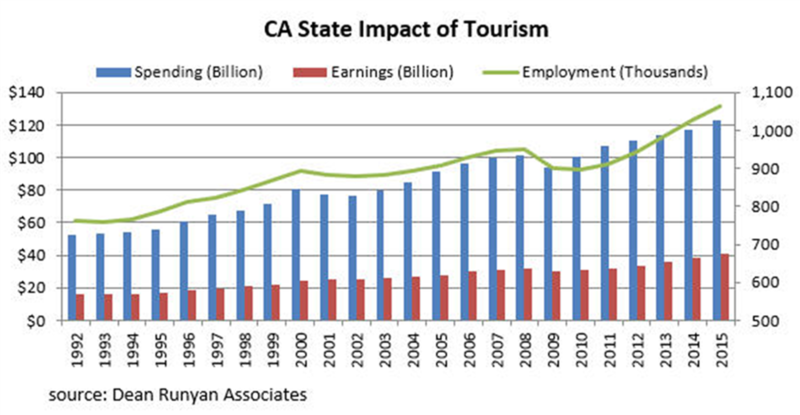 Likewise, California’s tourism industry, of course, is huge. It supported over one million jobs in 2016, equating to $45.4 billion in labor earnings. Visitors to the state spent $126.3 billion in 2016 alone, generating $4.9 billion in local taxes and $5.3 billion in state taxes. 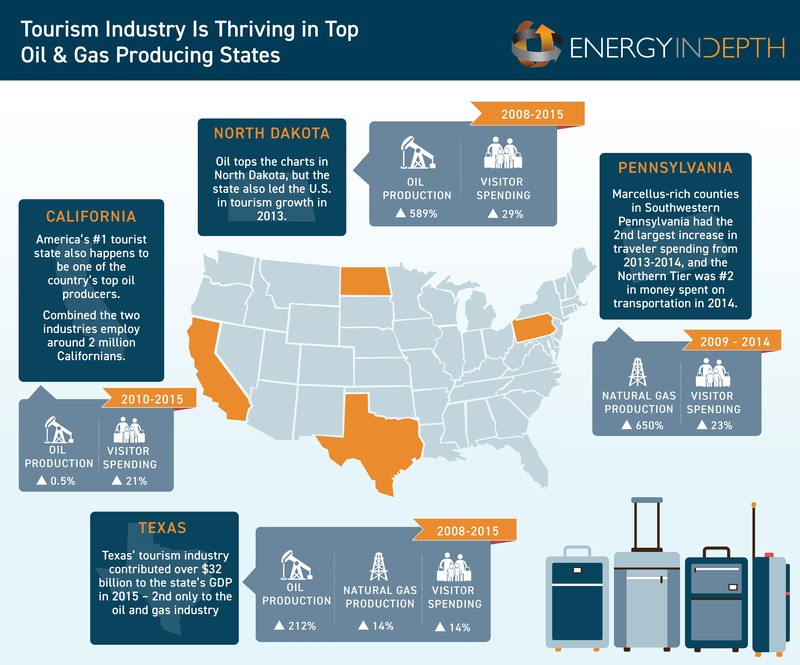 But California is not the only state where tourism has flourished alongside energy development. In fact, as EID’s latest infographic shows, the country’s top oil and natural gas producing states have all seen increased tourism while experiencing record-breaking production. The bottom line is that tourism does not appear to be negatively impacted by the presence of oil and gas development. Indeed, in the places where American workers are fracking their way to affordable energy, lower greenhouse gas emissions and better public health outcomes, the tourism industry is thriving. 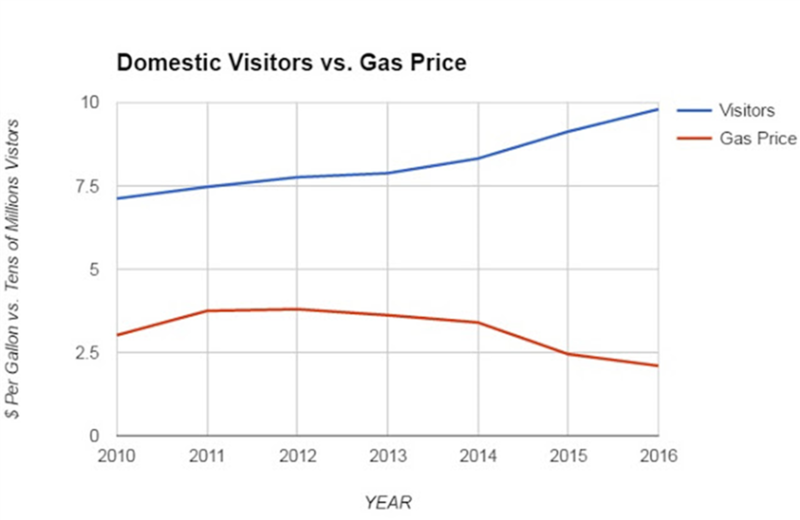 And with lower gasoline prices and higher incomes as a result of shale production using fracking, more and more people are able to visit tourism hot-spots like Florida this year.